Robert F. Kennedy addresses supporters April 4, 1968 in Indianapolis, informing them of the death of Martin Luther King, Jr. In this issue we turn from the turmoil swirling around the world and focus on the people – past and present – who have hunkered down and made a difference; people who restore our faith in human nature, proof that the good outweighs the bad; that America’s future can and will be brighter. Love More will trump Hate. We have to believe that going forward, the world will know more Bobby Kennedys, more Eunice Shrivers, more organizations like Concern, and more Mary Kay Henrys who will step up and stand out and speak out for a better deal for all, no matter the race, color, creed, gender, ability, or disability. Someone like Mary Kay Henry, who says that it’s not alright to have to work three jobs on minimum wage to put a roof over your head. As the first woman to lead the Service Employees International Union (SEIU), her phenomenal efforts on behalf of the working poor brings two other labor leaders to mind, both Irish and both women. The second is the Belfast-born Inez McCormack, the first female president of the Irish Congress of Trade Unions. Inez organized striking hospital workers in Belfast and successfully campaigned for the inclusion of strong equality and human rights provisions in the Good Friday Agreement, the 20th anniversary of which is also covered in this issue. One of the speakers at the McCormack event mentioned that the SEIU was Martin Luther King’s favorite union. The black leader was gunned down on April 4, 1968, in Memphis, where he was supporting striking sanitation workers. This year, fast-food workers striking across the mid-South were joined by workers from that 1968 sanitation strike, connecting the important historic action 50 years ago to today’s walk-out campaign by minimum wage earners. For us, Irish and others, the death of King will be forever linked to Robert F. Kennedy’s emotional appeal for calm in the aftermath of the shooting. In a black neighborhood in Indianapolis, he broke the news of King’s death and shared with the grieving crowd his own pain on the assassination of his brother. “We can move in that direction as a country, in great polarization – black people amongst black, white people amongst white, filled with hatred toward one another,” he said. Two months later, on June 5, 1968, Kennedy himself was gunned down in Los Angeles after winning the California Democratic primary. The man perceived by many to be the only person in American politics who could unite the people was dead. This year, to mark the 50th anniversary, the Kennedy/King Memorial Initiate will hold several events in Indianapolis to commemorate Kennedy’s memorable message of peace. 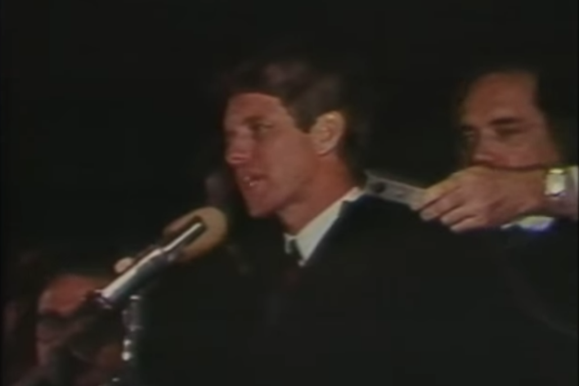 And in this issue, Chris Matthews marks the anniversary by writing about Kennedy’s humanity and love of the underdog, and where he thinks that came from. Bobby’s sister, Eunice, also featured in this issue, passed away on August 11, 2009, but her legacy lives on in the Special Olympics, which also marks its 50th anniversary this year, as does Concern Worldwide, the Irish-born relief organization that serves the poorest of the poor. In his Indianapolis speech about King’s death, Bobby Kennedy said, “It is perhaps well to ask what kind of a nation we are and what direction we want to move in.” Fifty years later, we are still asking that question. Could the answer be simply to put a little more love in our hearts? Kristopher Price, who took the cover photo of Mary Kay Henry in front of the “Love More” graffiti sign on a boarded-up building in Washington, D.C., certainly thinks so, and so do I. Interesting. Thanks for sharing this article.